Due to the earth's equatorial bulge the peak of Chimborazo (6,310m) is the point furthest from the center of the earth. In an effort to work off my own equatorial bulge I went for a cycle ride around it. A cup of coca leaf tea at 5,000m to help with the altitude then a 3 hour ride around the mountain to a village for a lunch of llama meat and potatoes. There are quite a few activities to choose from in Riobamba - I picked the devil's nose. The devil's nose is a train ride that winds its way down the side of a mountain. It was constructed in 1902 to link the coast with the highlands and judging by the state of track hasn't seen much maintenance since. Infact its so bad that trains are no longer allowed to use it so you make your way down on a bus converted to run on rails. Another Harley-Davidson moment - something I'm glad I did but am in no great hurry to repeat. 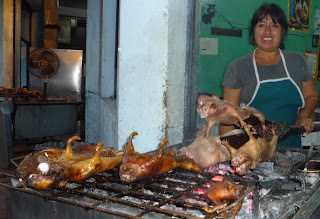 Guinea pig for dinner. Not an unpleasant flavour, a bit like turkey, but not a lot of meat and slightly off-putting having the head on the plate staring up at you. A day spent kayaking on Rio Pano, a tributary of the Amazon. Whilst enjoying a picnic in my own little piece of the Amazon basin I did consider the alternative - lunch in the staff canteen at work. I think the Amazon may just have the edge. I'm in the southern hemisphere, which means I've left autumn behind and am now heading into summer. Good news weight watchers - due to the centrifugal force at the equator you weigh about 0.3% less. Otavalo is famous for its Saturday market. Fortunately for me none of the locals seem to realise its Sunday. The church was constructed around a rock on which an apparition of the Virgin Mary was seen. I had another one of my pinch me moments today - I had to remind myself that yes, I really was riding my bike through Colombia. I'm in Columbia for goodness sake. How did that happen? Bogota is at an altitude of 2,600 meters which gives it a pleasantly cool climate after the heat of central America. It didn't take long for my first run-in with the Columbian police. Twenty minutes after collecting my bike from the airport and I was pulled over. In Columbia motorcyclists have to wear a flourescent jacket with their numberplate printed on the back (in an effort to reduce ride-by shootings). I obviously don't have one, but fortunately I managed to talk my way out of it. One of the local specialities is chocolate santafereno - hot chocolate served with bread and cheese which you dunk. Its a slightly more pleasant combination than I imagined. Unfortunately the Panamanians and Columbians haven't got round to building a road between their two countries through the Darien jungle and there is no ferry service either. That leaves two options - find a sailing boat that can carry a motorcycle for a 5 day voyage across the carribean sea or fly to Bogota. Not being the world's best sailor I've decided to fly. I've spent the afternoon having a tour around a coffee plantation and factory. I can now bore you with the reasons why Panama produces the best coffee in the world, and having had a tasting lesson heaven help anyone who makes me a bad cup from now on. Did you know.....coffee is the world's second most traded commodity (oil being the first). More rain today. This time I thought I'd be clever and take shelter in a restaurant. It was a good plan. Until the restaurant flooded. I thought it was kind of the Panamanians to put up a welcome sign for me. This bridge is the border crossing between Costa Rica and Panama. Its a railway bridge with a few planks of wood and some chicken wire to stop you falling over the edge into the river. Decide which line of planks to use and hope there aren't any gaps large enough for a bike to fall through. Soon after entering Panama the rain started. Riding through the hills it got heavier and heavier. Heavy enough to cause landslides, covering the road in mud and rocks, flash floods and in places washing the road away. I thought perhaps this was just par for the course in Panama but it was bad enough to be the lead story on the evening news. I later learned that soon after I passed through the road was closed totally. I was beginning to wonder if I was ever going to leave Costa Rica. I got as far as getting everything packed on Saturday and was just about to load the bike when I discovered a flat rear tyre. Rather than rush the repair I decided to stay an extra day. On Sunday I actually got as far as loading the bike and starting it. Unfortunately it then died and wouldn't restart. A bit of mechanical attention and I finally managed to leave on Monday.